The WV5 Premium comes with a small head which is great for smaller areas such as Georgian windows and smaller restrictive areas. 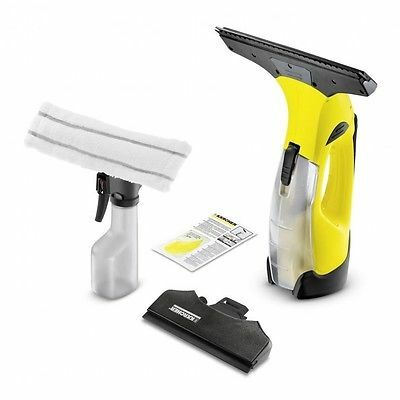 WV5 Premium also comes with a spray bottle with a microfibre cloth. Add in the Kärcher detergent and then spray onto the windows and agitate with the Micro fibre cloth to help clean the windows before removing the water to leave a streak free finish. 35 mins running time on full charge. Includes Large Suction Head 270mm, Small Suction Head 170mm for small windows, Spray bottle, Detergent.